On December 11-12, 2018 we provided the first edition of a hands-on workshop on the Linux containers (Docker and Singularity). Participation was open to the BIST institutions. The materials of the course are availble in this GitHub repository. The next edition of the course will take place on January 28-29, 2019. Participation in Bdebate "Open Science: From values to practices"
From October 4th to October 5th 2018 we shared with the rest of participants of "Open Science: From values to practices debate" our experience customizing and deploying different tools and frameworks for integrating Open Science as part of our daily work. We can now offer a new service at the bioinformatics unit: the ribosome profiling/Ribo-seq analysis: don't hesitate to contact us! Sarah attended the 2018 edition of the "Networks & Pathways" 4-day course at the EMBL-EBI, Hinxton, UK. Intense theoretical and hands on sessions on networks, pathways, graphs, provided by a great training team. The BioCore, with the help and contribution of Rodny Hernández Coello, Luis Expósito Piñol, Emilio Palumbo, Paolo Di Tommaso, and Estefania Mancini, conducted today the first ever (it finally became actual!) CRG workshop on how to start a bioinformatics project, to handle files and directories, to use git, GitHub and containers, to pipeline, and where to find software and mirror databases on the cluster. The collected feedback will be used to plan more in-depth hands-on on these topics. As part of CRG outreach activities, with other researchers and center's communication and engangement team, we participated in a few hours debate about the scientific and ethical challenges of technologies such as CRISPR with a group of invited secondary school teachers. Toni Hermoso BioCore member guided a Wikipedia editathon on biosciences organised by the Catalan Society of Biology (SCB). Attending scientists learned how to start and edit Wikipedia articles and how to manage and provide relevant publication references. More information (in Catalan). S-Biomedic NV, Belgium, a startup that brings novel therapeutic and consumer solutions to the skin microbiome, became the user of our services. 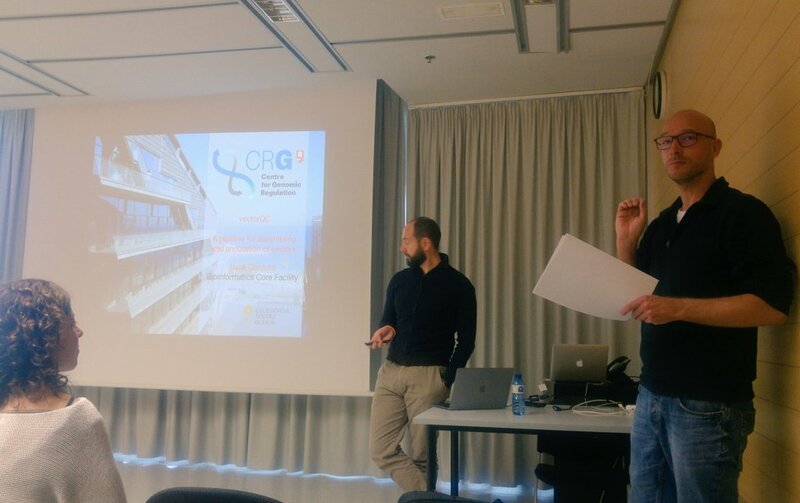 As part of Open Access Week 2017 edition, Guillaume Filion (CRG PI) and Toni Hermoso (BioCore member) organised an introductory session about Open Science and Life Sciences within the 2017 edition of OpenAire/Foster webinars. Slides. More information at CRG website. This year Sarah won the CRG technician training award, which allowed her to attend the "Interactive Data Analysis and Visualization with R Shiny" organized in Hostalets de Pierola by Transmitting science. Great week of hands on (delivered by Ashton Drew from KDV decision analytics LLC) that provides exciting new knowledge for the BioCore! Julia gave a short 3-hr course on microbiome sequencing and analysis at the Bioinformatics Bootcamp for Engineers organized by the Bioinformatics Barcelona Association (BIB). For two days, on Sep 14-15, 2017, the CRG run the NextFlow course, which attracted more than 25 participants. Luca Cozzuto, the BioCore member, was one of the course's lectors and instructors. The Vertebrate Alternative Splicing and Transcription Database (VastDB) is the largest resource of genome-wide, quantitative profiles of AS events assembled to date. VastDB provides readily accessible quantitative information on the inclusion levels and functional associations of AS events detected in RNA-seq data from diverse vertebrate cell and tissue types, as well as developmental stages. Read the paper in Genome Research. This year retreat was organized by Julia, Romina Garrido, and Lucas Carey of UPF. It took place in Saint Feliu de Guixols of the Costa Brava in June 15-16, 2017. According to the survey of 79 participants, 87% found the retreat helpful for their studies/research, 75% enjoyed the grant proposal game that was the retreat's highlight, 91% liked the lightning talks sessions about the future and current research problems, and 90% agreed that the retreat program was balanced in terms of free/fun and scientific activities. And despite the problems with electricity going on and off during talks and a bad WiFi, everyone liked the venue. You can find the survey results here. We just finished the 3rd sequence of the CRG course Introduction to Biostatistics in R ran in May-July 2017. More than 50 students attended 3 days of lectures and 31 hrs of hands-on practicums in R. The courses details can be found here and here. Julia and Sarah participated in the Core Facilities Management Workshop, July 6-7, 2017, organized by and hold at CRG. Dr. Elizabeth Balyejusa Kizito, Head of the Department of Agricultural Sciences, Uganda Christian University, is working together with the CRG Genomics and Bioinformatics units on the development of a robust set of genomic tools for more efficient breeding in Solanum aethiopicum. The Women for Africa Foundation is a Spanish private, non-profit entity created in February 2012 by María Teresa Fernández de la Vega, the former Vice President of the Government of Spain, with the aim of promoting African women’s leadership in scientific research and technology transfer. Read the El Periodico article here. Jason Limberis’ project concerned the in vivo transcriptional profiling of Mycobacterium tuberculosis from highly infectious TB patients. Melissa Nel, MD, has worked on WES and variant identification in treatment-resistant juvenile-onset ophthalmoplegic-complicated Myasthenia Gravis patients. Toni talked about the browser-centered sequence analysis services. Members of the CRG Core Facilities presented to the public the Saca La Lengua project about the study of the mouth microbiome at the Barcelona Science Fair. The comprehensive resource of lncRNA localization in human cells, the LncATLAS database, is based on RNA-sequencing data sets and contains 6768 GENCODE-annotated lncRNAs represented across various compartments of 15 cell lines. Read the paper published in RNA here. The title of the talk was Interactive Data Visualization: Visual and analytical insights into complex biological data. The study, published in the journal Scientific Reports, identifies the gene that causes Opitz C syndrome in the only patient diagnosed with this ultra-rare disorder in Catalonia, which affects only sixty people in the world. The identified mutation in the gene MAGEL2 coincides with the one seen in some patients with another minority disease, the Schaaf-Yang syndrome. Here is the link to the news on the CRG website. Luca presented the talk AnnoWiki: Genome annotation management system.